The history of agile marketing comes from software development. The Agile Manifesto published online dictated software development into the future. The premise is to not plan anymore than you have to, and to build things incrementally and iterate on your design. Marketing leaders took agile and applied it to marketing. During a Sprint Zero event, they penned the Agile Marketing Manifesto. 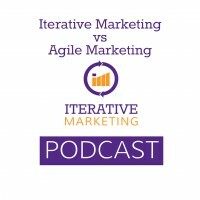 Agile Marketing solves a lot of the same problems as Iterative Marketing. The Agile Marketing Manifesto is broken into values and principles, not much different than our Fundamental Truths. One key point of differentiation between Agile and Iterative Marketing, is that Agile embraces campaigns, while Iterative Marketing gets away from campaigns altogether. This podcast compares and contrasts Agile’s values and principles to Iterative Marketing’s fundamental truths and actionable components.